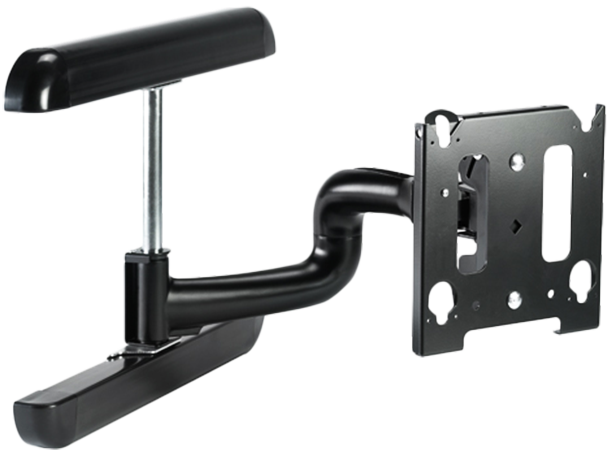 The Large Format Display Swing Arm Wall Mount provides extended viewing angles for large format displays weighing up to 125 lbs (56.7 kg). The Large Format Display Swing Arm Wall Mount installs on 16″ centre studs. This can be mounted within the wall with the In-Wall Accessory for a “no-profile” mounting solution. It extends 24.88 ” (63.2 cm) from the wall and remains low profile in the home position. This mount has easy fingertip tilt adjustment from 0 – 15°, it also has an integrated lateral shift up to 9″. For ergonomic user preferences, it can swivel up to 90 degrees left or right (depending upon screen size).